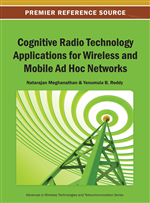 Secondary receivers in Multiple-Input Multiple-Output (MIMO) Cognitive Radio (CR) networks combat interference from primary transmitters while equipped with whitening filters. However, when the MIMO secondary users are employing Radio Frequency (RF) beam-forming networks at the transmitter/receiver front ends to improve the MIMO transmission performance, the whitening filters cannot perform interference cancellation. In this chapter, transmit/receive optimum RF beamforming is proposed for a MIMO spatial multiplexing system. The performance of the optimally designed RF beamforming technique is evaluated over a Rician channel via computer simulations. Simulation results are assessed for different RF beamforming structures and the number of primary transmitters causing interference on the secondary receiver. In this chapter, the MIMO cognitive network model proposed in (Zhang, 2008) is considered. This model is depicted in Figure 1 while the MIMO secondary user is equipped with RF beamforming capability. According to this model, it is assumed that all the primary users and the secondary user share the same bandwidth for transmission. The MIMO secondary user consists of a NT element transmit and a NR-element receive array antenna. In this framework the secondary physical channel, including radio propagation environment and transmit and receive antennas, is modeled by a NR × NT matrix Hs. There exists Nt < NT transmit RF chains and Nr < NR receive RF chains. The transmit RF beamforming module, which is mathematically represented by a NT × Nt matrix WT, is made out of a Linear Network (LN) including power splitters/combiners and phase-shifters and variable gain amplifiers1. The receive RF beamforming module, herein represented by a Nr × NR matrix WR, is practically made out of an after Low Noise Amplifier (LNA) mounted, co-called post-LNA, LN with the same components as transmit LN. We assume that the MIMO channels from the secondary transmitter to the secondary and primary receivers are perfectly known at the secondary receiver and transmitter. Thus, the secondary transmitter is able to tune its RF beamforming network based on the channel information to maximize the secondary transmit throughput and combat any interference at the primary receivers. Moreover, with the channel knowledge at the secondary receiver we will be able to optimize the applied receive RF beamforming network.